Have an excess of cooked burgers after hosting your BBQ party? 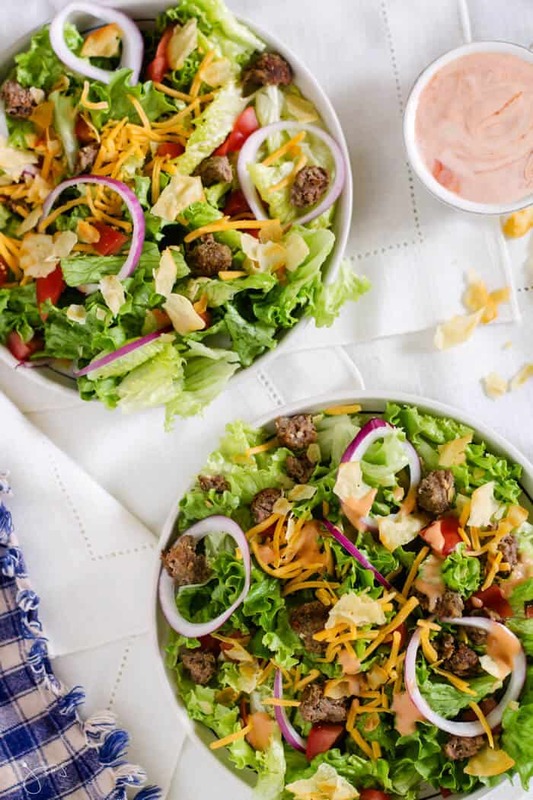 Turn them into family-friendly weeknight dinners like this leftover cheeseburger salad drizzled with homemade hamburger dressing and topped with crumbled chips. Not only is it quick and easy to make but absolutely delicious and light too. It’s a perfect solution for lazy weekdays. If you’re like me, you load up your grill with food to last for days. I always feel like a waste if I’m not crowding it with all kinds of goodies, don’t you? I asked that question on my Facebook page and most people tend to agree. It’s a given to have cookout leftovers when COOKOUT SEASON is in high gear. Too much is always better than not enough when it comes to food. Cook once eat all week is such an easy solution for busy people. Who doesn’t want to spend more time with family and friends instead of cooking every day, amirite? In just a few minutes you’ll have a delightful lunch at home or on the go. 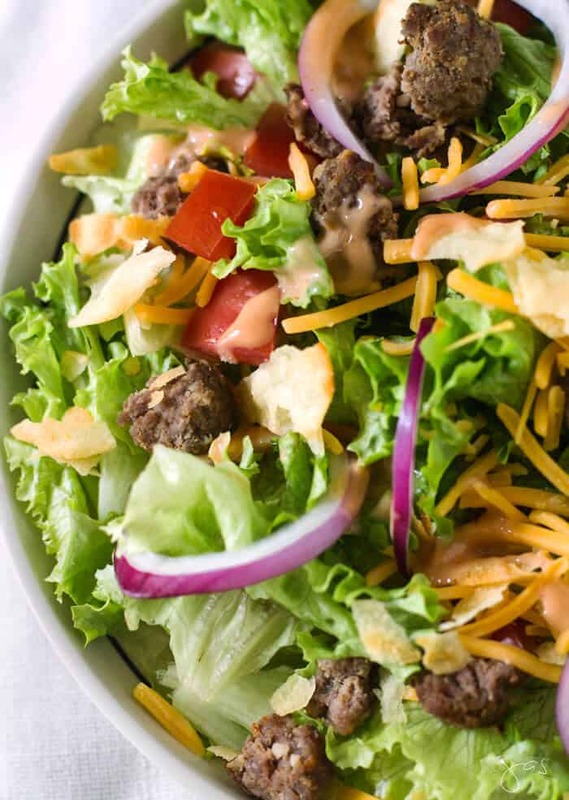 I like to add crumbled bacon and chopped pickles to this cheeseburger salad too or add whatever you usually put on your BURGER. The more the merrier. If you are wanting a little bit more protein and fat in this salad, add in some leftover chicken pieces and top with sliced avocado. Ta-da! You’ll be amazed at how substantial this meal is. YOUR TUMMY WILL BE SO HAPPY! WHAT TO DO WITH LEFTOVER BURGERS? Crumble and use in tacos or quesadilla. Put them on a baguette with grilled onions, pepperoncini, and top with marinara and melted provolone cheese – like a meatball sub. Crumble the hamburger up and heat it in spaghetti sauce. Serve over spaghetti. Mix crumbled hamburger with sautéed onion, green pepper, cooked rice, and tomato sauce and use to stuff green peppers. Top with shredded cheese, cover and bake until peppers are tender. Crumble up and mix with sloppy joe sauce. Crumble and use as a topping on homemade pizza. Turn them into Salisbury Steak: top leftover beef patties with a gravy made from 3 tablespoons flour, 2 tablespoons butter, 1 cup beef broth, 1 sliced onion, 1 package fresh sliced mushrooms, and 1 tablespoon Worcestershire sauce. Crumble the burgers and add to chili. Use it to make a Shepherd’s pie. Do you have any recipes for using leftover burgers? 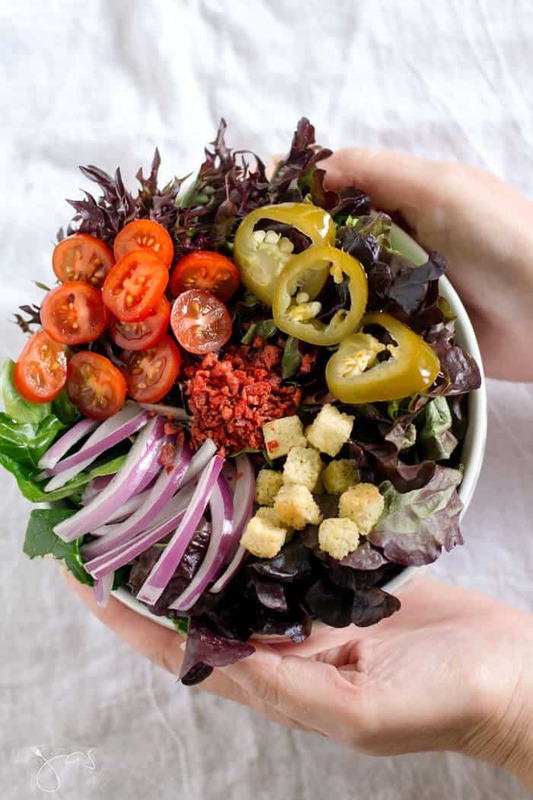 Divide the lettuce, burgers, tomatoes, cheese, and onions among two salad bowls. With a whisk, combine mayo, ketchup, and water in a small bowl. Drizzle evenly over salads. Sprinkle with lightly crushed potato chips. Enjoy! 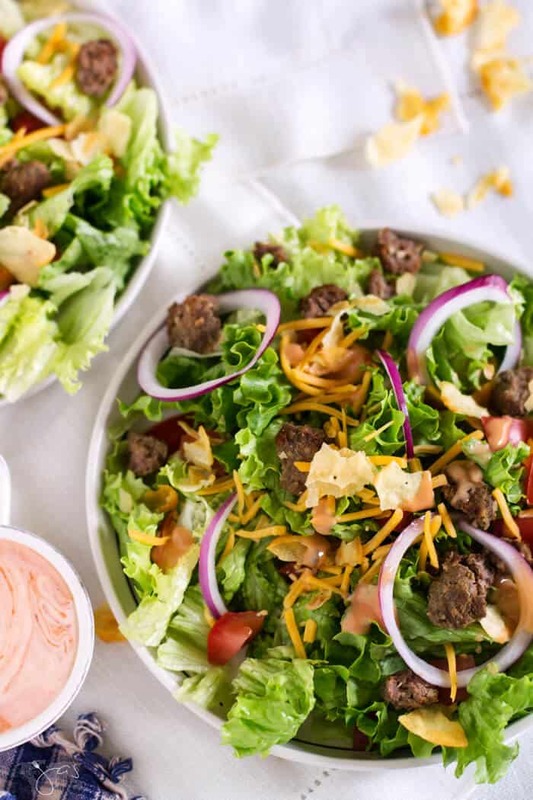 Leftover cheeseburger salad drizzled with homemade dressing and topped with crumbled chips is a quick and easy meal perfect for lazy weekdays. 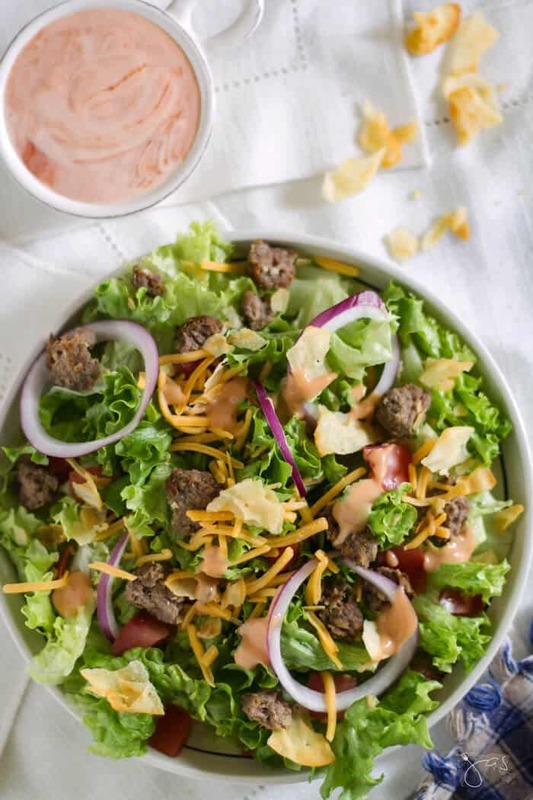 This cheeseburger salad recipe is featured at Miz Helen’s Country Cottage, Keeping It Simple, and Our Mini Family. This is brilliant and very timely since I have some leftover cheeseburgers. Will definitely make them into a salad tomorrow. Thank you so much for sharing this. The shephards pie idea is good…. Yes, it is! Thaks for stopping in, Lydia! That looks delicious! We often have leftover meat after grilling for a party and this is a great and healthy way to use that up. Thanks for the idea. Pinned. My mouth is watering! I know I’ll love this recipe. It’s a great one for the summer. Printed! It truly is a good salad! Thaks for stopping in! This looks so good, will definitely have to try and I love the other ideas to use up leftover hamburgers. Thanks for sharing at the Bloggers Pit Stop. Thank you much, Connie! So glad you like it! This looks so yummy and such a good idea! Thanks for sharing!